Take a seat and drive as fast as possible in the Playseat® Sébastien Buemi Special Edition! Playseat® chairs are used by professional drivers to simulate races and to learn new tracks and this Playseat® Evolution model is signed by former Formula 1 driver Sébastien Buemi himself! This racing simulator has been designed in cooperation with Sébastien Buemi who acknowledges the unique Playseat® quality and confirms that Playseat® racing chairs faithfully reproduce the feeling of driving a real race car! The Playseat® Sébastien Buemi can be used by gamers of all sizes, so all your friends and family members can enjoy this racing chair. 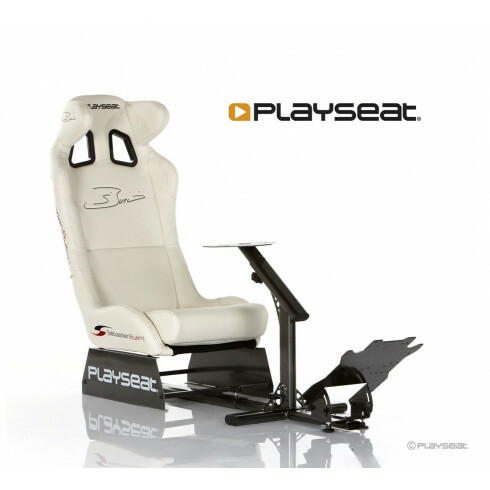 Playseat® Sébastien Buemi Special Edition is very comfortable, stable and highly adjustable. Thanks to its unique foldable design, it uses little space when not in use. Experience how realistic and fun racing games can be with Playseat® racing simulators! Developed in cooperation with Sébastien Buemi! BUY the gearshifholder and the Seat slider. The extra fee are nothing compare to the feeling thay add to chair. And so much easy to assamble the cair and add these things in the process from the beginning, otherwice you need to put the chair apart again and it is actuallt Little work. It take a while to assamble the chair but the manual are great so it is not hard at all but it take a while.